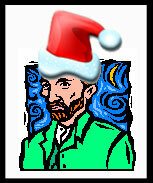 VanGogh’s Secret Studio returns for a fifth year! This fundraiser is a special shopping opportunity for kids 12 and under. Young shoppers will be able to choose from a special selection of handcrafted gifts priced from $1-$5. Volunteers will be on hand to help children shop, and all purchases will be wrapped. Click here to download a shopping list you can fill out for your child. Volunteers will be on hand to help children shop for their surprises and stay on budget. A parent or guardian must remain in the building while a child shops in VanGogh’s Secret Studio. The Studio will be open Saturdays in December (12/5, 12/12 and 12/19) from 10:30am-2:30pm.